Well, like most businesses, this has been the busiest time of the year for me so far. Having only been a fully functioning business since the 1st September 2012, this is our first experience of the Christmas rush. I’ve finished all my handmade orders now so just fulfilling ready made items. So, it’s just Etsy and eBay and The Pop Up Boutique at the moment. So, I’ve finally had a bit of time to buy the final pressies and put the tree up! In between ‘normal’ Christmas activities, I’ve been reflecting a little bit on the first 2-3 months of trading and what worked well and what’s maybe a ‘development opportunity’ (to quote an old company of mine that didn’t like to mention negatives). GOOD – Etsy has been cheaper to maintain but has been a bit of a slow burner and not brought in as many sales. But, it’s a great community and I’ve connected with a lot of like-minded people. That’s a good success in my books! GOOD – Doing a few markets has been great. It’s been interesting seeing what people picking up and liking in person and the questions that they ask. The Sunday markets at Barton’s have brought in quite a few orders for me. It’s been a really nice atmosphere there too and I’ve been able to meet and network with a lot of other stallholders. GOOD – I’ve also took park in my first pop up boutique. This has been another interesting experience. Sales there have not been as high as I would have hoped but the learning experience and the ability to meet and network with other people in the same industries has been invaluable! BAD – At first I focussed on eBay auctions. This was actually an expensive option for me and drove traffic that wanted something cheap, rather than a quality item. I’ve moved over to mainly fixed price listing now. BAD – I’ve struggled a bit with getting stuff together for the Christmas rush as I should have been planning, buying and making things a lot earlier. Look to take part in more events – markets, fairs, pop ups. Get a good set of events listed. Get networking and collaborating more. Get a calendar together so that I can plan ahead and make sure I have enough stock and variety in place for certain events such as markets or Valentine’s Day etc. Get a new base so that I don’t keep filling up the spare room and the dining room! Also in the New Year I’ll be starting up a sister business to set up websites and social media for small businesses. This will see me actually using some of the skills I’ve gained over 15 or so years, in doing similar things for large businesses such as Capital One, Alliance & Leicester, Punch Taverns and Nottingham Trent University. These joined up online places will be easy to maintain and won’t cost a fortune! P.S. Just realised that I haven’t really finished my orders as I still have a couple of things to make for family…. We’re pretty excited here at Quirky Purple! We’re off today to set up our area in our first ever pop up boutique collaboration! I would imagine that anyone involved in vintage, handmade and remade are pretty busy at the moment. What with online sales, Christmas markets and the like, it keeps us all busy. Not just in appearing at market, but also making things for the market. Last week, it was getting to the stage that every time I made a zombie kindle cover or tea cosy, I sold it. I was on a zombie treadmill for a few days! Anyway, back to the pop up boutique. 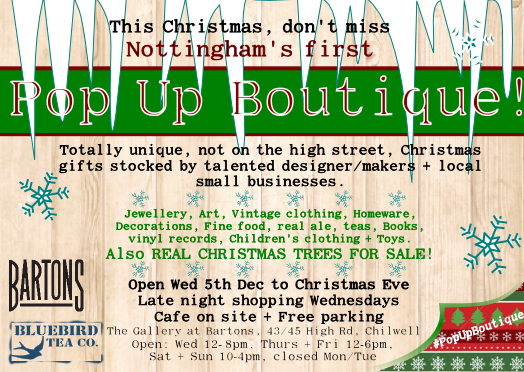 We’ve run a couple of stalls at Bartons over the last few months and this first pop up boutique for Nottingham is a collaboration between Bartons and Bluebird Tea Co.
We’ll admit to being a little bit excited! It starts on Wednesday 5th December at 12pm and runs through until Christmas eve. There’s also a launch night at 7pm on Wednesday 5th December with mulled wine and mince pies (and I think there are also some other lovely goodies). Opening hours are on our Events page. I hope we see a few of you there. Remember, this boutique has things that are not available on the High Street. You don’t want to buy the same as everyone else. Buy something different, original and maybe a one off!